A big part of what you get with a good fly fishing guide is an opportunity to learn about equipment. Year in and year out I see people bring their own gear, most of the time this gear needs to be adjusted. I always bring fishing rods for my clients just in case what they bring isn’t up to my standards. Basically, if you fish with me you can bring your own gear or fish mine, it’s up to you. That said, you should be warned, fishing my stuff often leads to hundreds of dollars being spent afterwards. Having the right gear makes a difference and some days it’s the difference between an easy day and a hard day. I try to stay up to speed on the latest greatest fly rods, fly lines and fly reels. Keeping up on all the stuff comes at a pretty good expense and there’s a lot of trial and error but the final result is pure awesomeness. 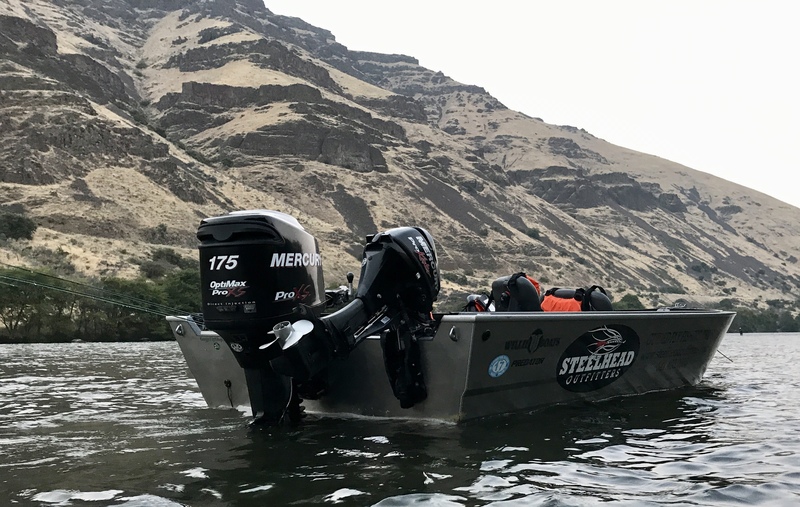 In my boat during steelhead season you’ll find several Spey rods and reels plus a couple dozen different lines and sink tips. There is literally no situation I am not ready to address when it comes to equipment. Let’s talk about trout fishing. I like a fly rod that is “general purpose” and for me that’s a 9 foot rod line weight 5 or 6. Industry slang for these rods is 590 or 690’s, these are the 30-06 rods, or do it all rods. Fly lines should be weight forward and a bump line. A “bump line” is half size up so for a 590 fly rod the bump line would be a WF 5 ½. In addition to a bump line the length of the fly line taper or head should be short not long. 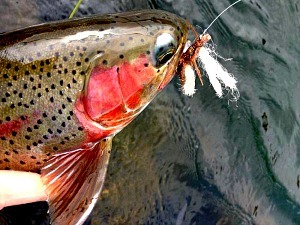 The reason for the shorter head is that it aids in shorter casts, and bigger flies which is what we do on the Deschutes. The Rio Grand is a perfect example of the type of line you should be using, all line manufactures have an equivalent. What you don’t want is a longer head length requiring much more fly line to load the rod, this leads to poor casting at short distances for the average angler, this is a line for fishing lakes. The reels we use for trout fishing really aren’t that important to our success, at least not what I do. The purpose of the reel is basically to hold the line for most trout fishing purposes but every once in a while you find that fish, the one who takes you for a ride. The most important attribute for a trout reel is durability and for me that’s a Hatch or a Galvan reel, something you can fall on and not break. Steelhead rods for me are Spey rods. I like 6 weights for dry line work and 7 weights for sink tip work. It’s effective to fish 6 weights with sink tips and 7 weights with dry lines so don’t be afraid to run the one you brought. As lines continue getting shorter and more efficient Spey rods keep getting shorter but in general a good Spey rod is something 12 to 13 feet in length (we are not going to talk about “switch”rods but if you got one, bring it). Ten years ago rod lengths were 13 and a half feet to 14 feet in length…todays rods are a lot funner and lighter. I don’t know anyone who doesn’t fish shooting heads today. Shooting heads, specifically, Skagit, Scandi and Rage heads connected to 100’ of running line by a loop to loop connection allow us to use one reel for two or more lines. 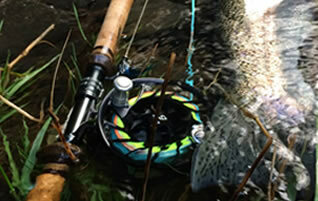 Reels are like jewelry to most steelheaders, the more traditional the reel is the more of a status symbol. Function over form in my boat, although I do have a Hardy Perfect. Steelhead reels like trout reels must be burly and heavily built, they also need to have a good reliable drag. Steelhead often tear line from the reel deep, deep into the backing so reels need to pick up line fast. I’ve fished many different reels and they’re all plenty good but Hatch reels seem to be the most reliable and error free, I also fish Lamsom and Galvan reels. This is my down and dirty equipment list, I hope it dumbs things down a little for you. Remember, I have a lot of stuff and am happy to let you drive it, it’s part of the deal. Large arbor reel with general purpose weight forward fly line, preferably a bump line. Large Arbor reel, generally to fit a weight forward 10 weight line. Shooting head set up with both Skagit and dry line heads. Sink tips, floating poly leaders. Skagit lines, sink tips, big flies. fly rods, gear, sam sickles, spey rods, summer steelhead. Bookmark.